BRRRRRRRREAKING NEWS! 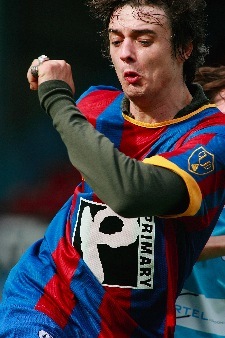 Slightly smelly super hoops fan Pete Doherty apparently wants to become a football manager. According to a report on NME.com today, the singer who once said “QPR is the only thing he prefers to narcotics”, is being lined up to manage a team suitable named Doherty FC. There could be only one model loving naughty, naughty man between the sticks for Pete. He sings, he’s mental, he lurves QPR… has to be in. The Reading and Cardiff legend has to be the most rock ‘n’ roll footballer of all time. Plus he’s the only man ever to be sent off for defecating in Lawro’s kitbag, which for our money is worthy of a place in any team. Okay, okay, that’s not our best effort, but Kenny’s out of work at the moment, so he’d be up for it. Perhaps football’s greatest ever singer. (Does rapping count as singing? If yes, Barnes is better.) The Diamond Lights legend, could croon with Pete in training. Once described as “an armoured car of a winger” the Ugandan nutjob commonly known as “Vodka Vic” also liked a drink. Pete’s all time hero, again, he just has to be in. The young Valencia starlet fits the bill and would probably bang a few in. The egg headed Italian legend loves smoking as much as Pete. He openly admits to smoking 10 a day even when he was playing for Chelsea. Bless. Surely Paul Gascoigne is worthy of a place in the starting line-up. And maybe Robbie Fowler who tried to snort the touch line once. I bet even Doherty hasn’t attempted one that big! Surely the 40-a-day smoker Socrates deserves a place!